Hong Kong prosecutors said the single mother, now 33, had trafficked 1,934 grams of methamphetamine, a drug more commonly known as Ice, worth US$73,900. On November 7, 2015, Li was intercepted at Hong Kong International Airport while en route to Malaysia to help deliver clothing samples for her Nigerian boyfriend identified as IK, who said he would set up business in her home province. However, the woman insisted she knew nothing about the drugs and that she had been conned to make deliveries for her Nigerian boyfriend (IK), whom she had trusted. 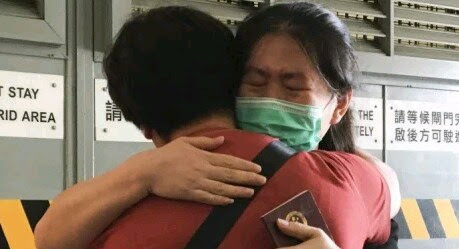 In the pic above, Li Dandan pulled her mother in a tight embrace as soon as she emerged from a Hong Kong court’s cell holding unit, free at last from a drug trafficking case hanging over her head for three years. Beside them stood prison chaplain Father John Wotherspoon, who had waited anxiously for Li’s release, having spent the past two years helping her prove her innocence.